Item Number: 810-503R 18336 Actual Weight: 4.5 lbs. 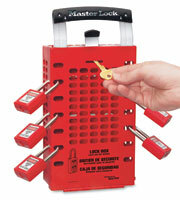 Contain keys for secure lockout of large equipment. Features a patented locking mechanism that prevents keys from being accessed until the last padlock or lockout hasp is removed from the box. Message on box is printed in English, Spanish, and French. Can be used for both portability or wall applications. Lock box holds 14 padlocks or hasps and dual application box holds 14. Box holds hundreds of keys. Padlocks sold separately.